I'm not much of a swimmer! I can swim but am not a natural water baby. When we visited the Lake District, one of my friends went swimming on Crummock Water (not the lake in the picture). Instead, I climbed Rannerdale Knotts! But the lakes in Cumbria are quite awesome! One day we drove back and saw a still and clear reflection of a mountain in a lake that made it look as if there was an endless drop down into the lake (a bit like the reflection in the picture below). Matthew 14:25 - Shortly before dawn Jesus went out to them, walking on the lake. 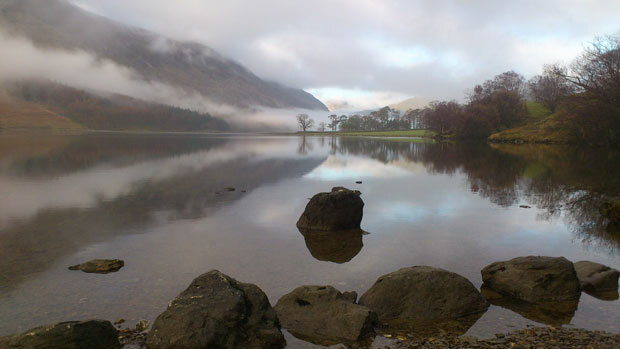 This picture is again from Buttermere Lake in Cumbria, England. The mountain, the sky and the trees are reflected in the lake, with a mist hovering and the sun breaking through in the sky. Very picturesque! The Bible is quite an extraordinary book. While other books go to great lengths to be very ornate or use clever language, the Bible is actually pretty under-stated. People's faults aren't glossed-over, there are some pretty interesting stories, some crazy things that happened. And Jesus isn't like some 'holy man' who we can't relate to. He is very real and the Bible presents Jesus as being real and true. In Matthew 14.25 we have a very simple statement - 'Shortly before dawn, Jesus went out to them, walking on the lake' ! No wonder the disciples cried out in fear! It wasn't even light and someone comes towards them like a ghost, floating on the water. But the Bible (unlike many preachers) just presents it very simply and very under-stated! Jesus is supernatural. He had spent the night alone, praying on the mountainside and therefore the disciples were already a way over the lake in their boat. But Jesus didn't row out on his own. He does things differently - he walked across on the water. This was probably the fastest and easiest way to get to the disciples but he probably did this as well to show who he was (fully God and yet fully man) and to encourage or even test the disciples in their faith. Peter got out of the boat and walked on the lake as well, but fear and unbelief got the better of him, he took his eyes off Jesus and he started sinking. He cried out to Jesus and Jesus rescued him. Jesus told Peter he had little faith (and yet he walked on the water!) asking him why he doubted. As Jesus climbed into the boat, the wind died down and the disciples worshipped him, realising he was the Son of God. You can see the supernatural power of God in your life. It takes faith, belief, not doubting, hearing God's voice and getting out of the boat. It also means recognising that Jesus is the Son of God and with God, all things are possible. Matthew 14:31-33 - Immediately Jesus reached out his hand and caught him. “You of little faith,” he said, “why did you doubt?” And when they climbed into the boat, the wind died down. Then those who were in the boat worshiped him, saying, “Truly you are the Son of God. A Prayer: Lord, thank you that you are a supernatural God. You have put your power in us by your Holy Spirit on the inside of us. Lord, we want to be people who hear your voice, know you, believe you for what you say and respond with action. Lord, lead us out of the boat into every good plan you have for us. We respond in faith, with belief, expectation and in complete trust. Thank you. Amen.